Located in Chesapeake, Homewood Suites by Hilton Chesapeake - Greenbrier is within a 15-minute drive of Greenbrier Mall and Norfolk Premium Outlets. 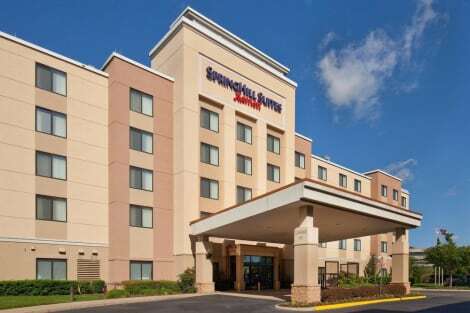 This hotel is 10.3 mi (16.5 km) from Virginia Beach Town Center and 10.1 mi (16.3 km) from Norfolk Scope. Satisfy your appetite for dinner at the hotel's restaurant, Great American Grill, or stay in and take advantage of the room service (during limited hours). Full breakfasts are available for a fee. Make yourself at home in one of the 90 air-conditioned rooms featuring refrigerators and LCD televisions. Your bed comes with down comforters and premium bedding, and all rooms are furnished with sofa beds. Complimentary wired Internet access keeps you connected, and digital programming is available for your entertainment. Private bathrooms with shower/tub combinations feature complimentary toiletries and hair dryers. Featured amenities include complimentary wired Internet access, a business center, and express check-in. Planning an event in Chesapeake? This hotel has facilities measuring 3130 square feet (291 square meters), including conference space. Free self parking is available onsite.